I know Valentines is over. I may be spacey at times but I do realize this. However, I made a super cute bento lunch for Pierce on Valentines and I wanted to share it. Pierce had some pink punch, a strawberry, celery filled w/ peanut butter, a cinnamon heart, homemade bread cut into I and U with a heart Babybel cheese sandwiched between. Rolled up bologna and all on a bed of roasted seaweed. Sadly, this was at the height of Pierce's reflux flare up, so all he ate that day was the strawberry and a bite of bologna. He didn't even eat the cinnamon heart! Thankfully, he's now feeling much better and I even tricked him into eating spinach last week that I snuck into a casserole, just like a good mother should. Love it, as usual! So glad to hear he's feeling better! That strawberry is so big! I love the message. What a great lunch! I bet he liked it! !! Have a great monday!!!!! Love it all but especially the bread and cheese idea! I'm glad he's feeling better now. I'm glad he is feeling better!! That box is super cute! I love the heart cut into the Babybel! How cute that lunch is. Oh no!! I didn't know Pierce had reflux. That is really sad. I am wondering if grapefruit seed extract might help that? It doesn't taste that great but you may be able to hide the taste in juice or something. Also, could he be low on magnesium? The Doctor told me that is why most people don't digest correctly. We don't get the magnesium out of our foods because the ground is depleted where the foods grow. Your son must really look forward to opening up his lunch every day. Such wonderfully fun displays of healthy food. I'm glad he's feeling better. This is just adorable, I especially love the I heart you!!!! Gosh, I hope he does not have too many more of these attacks!!! Now that is too cute. 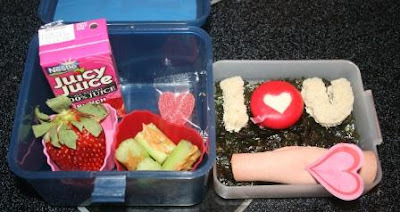 How do your kids respond to creative lunches like this? If it was me, I would cobble it all up. Making lunch fun for kids is what helps them to actually eat it. Am I right or wrong? That looks so good and creative. I really really have to think about doing one of these one Monday! Glad Pierce is better, reflux is so painful. I'll have to think about the seaweed, it would really be a new food for me! SO SO cute!! Like always! I love it. That is cute! I'm sorry he wasn't feeling well enough to eat all of it, though! That was so cute Lisa! Too bad he wasn't feeling up to eating it all because those are some very yummy looking things. It sounds like a very fun and yummy lunch. We hope Pierce keeps feeling better. All your love will help the most. I love that!! Wish I would've thought of the "I heart U" for Valentine's Day!! What a cute idea!! Glad to hear Pierce is feeling better! I thought it was a bed of raisins and then I read it was seaweed!